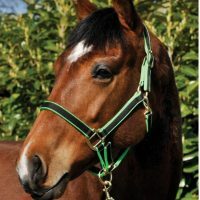 We have a large range of headcollars and leadropes for your horse. Choose from classic leather wear or bright and funky colours to suit your horse’s personality. Keep your horse safe out in the field with our Field Safety Headcollars, just the job for those difficult to catch four-legged friends! Brands in stock include Bridleway, Shires, Cottage Craft and HKM.